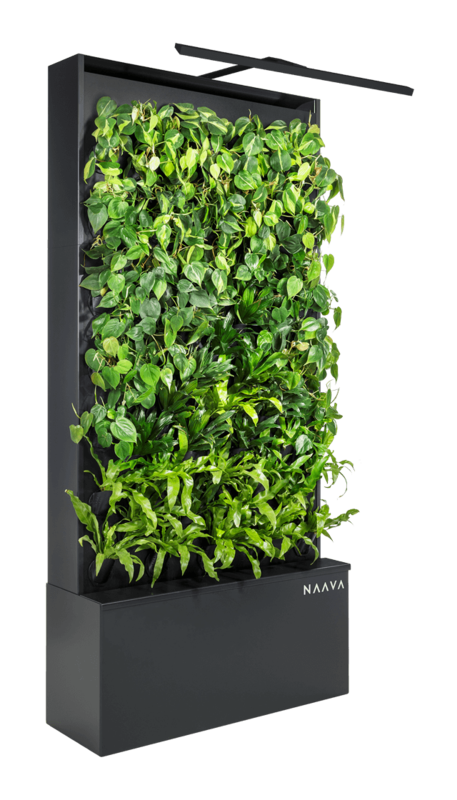 Naava Green Wall and Service are designed to cater to the needs of architects and designers. 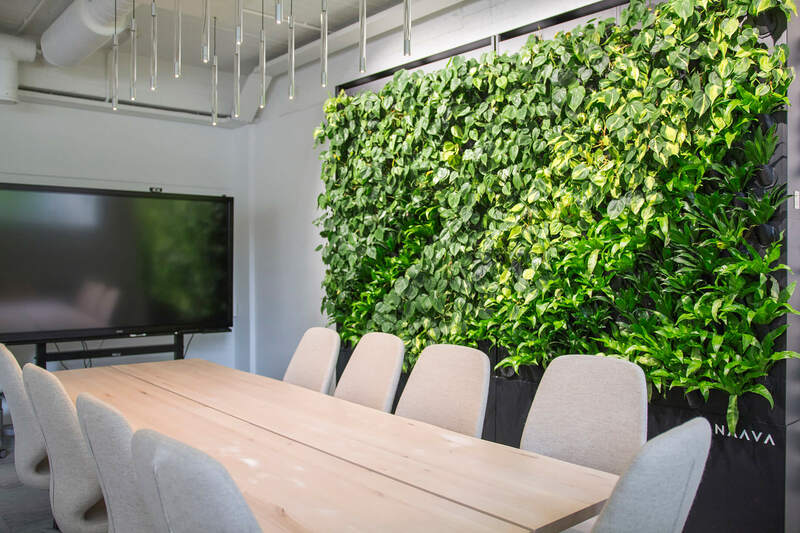 Our easily installed, fully automated and soilless smart and active green walls have been scientifically proven to purify indoor air and topped off with an all-inclusive maintenance service, so you can design green interior solutions that stand the test of time. Naava's polished, Nordic and minimalistic design has been created to bring the effects of nature and fresh air indoors. The main focus remains on the lush beauty of the plants, while hidden inside the frame there are various functions enhancing the ease of use from artificial intelligence to automated irrigation. Our models Naava One, Naava One Slim and the double-sided room divider, Naava Duo, enable nature to be brought indoors effortlessly. Over 2 000 installed Naavas in customer spaces is a sign of our trustworthiness and quality. “I like the fact that Naava is so minimalistic. We have used Naava in many different spaces. It never clashes with the space it’s in - it only brings out the beauty of the plants.” Hanna Gullstén, Gullstén-Inkinen. The spaces around us change and transform quickly these days. If the function of a space changes, the Naavas will move and change with it. The modular design of Naavas enables you to create larger, more striking entities. By placing different sizes of the same model side by side, you can effortlessly create an element to remember. See and feel the Naava effect. The feel of fresh air and the presence of nature cannot easily be transmitted through the screen. Come visit our showroom to see the Naava models with your own eyes and to experience their effect on indoor air. Why did ÅWL choose Naava instead of a typical green wall? Our Naava Service team will ensure a professional installation of Naava from start to finish. Naava is installed in the space at the same time as any other pieces of furniture once the space is otherwise finished and everything else is installed. All Naava One Slim models and 3 000 mm high Naava One models are secured to a wall with minimal bracketing for safety reasons when installed. Our Naava Service team will take care of this as well. The delivery time for our standard products is about 4 weeks. Please take note of longer delivery times and possible extra costs for all other products." Naava is lit with a lighting fixture attached to the top of the frame. Naava can also be lit with spotlights which are attached separately to the ceiling above Naava with a spotlight track. to the measurements. The spotlights are available in white, silver and black. 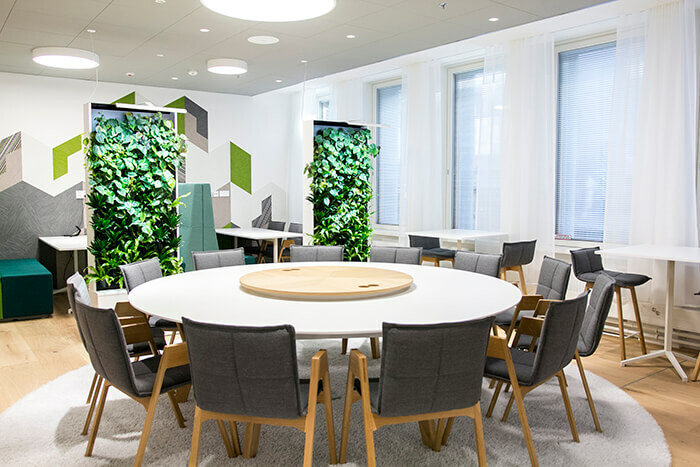 Naava can even be placed in places with no natural light thanks to the power of Naava's lighting fixtures, which is optimal for plants at 5700 K. The lighting is usually timed from 7am to 10pm and should be adjusted according to the recommendations provided by Naava experts. 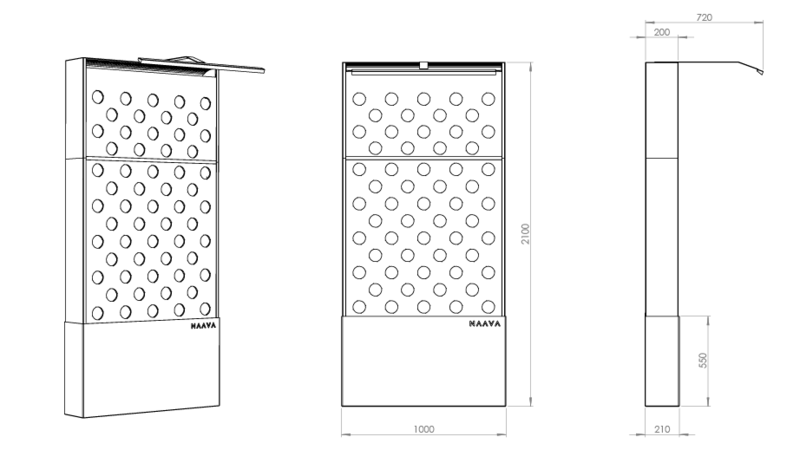 A standard outlet with continuous power. 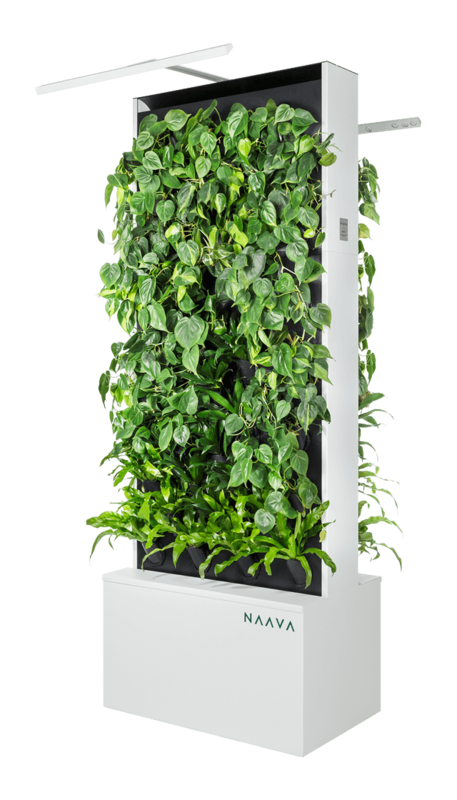 Naava's functions from automation to watering require electricity. Naava's electrical cord comes out from the top corner of the green wall with a length of about 4 meters. The outlet should not be located behind the product as it should be easily accessible. There should always be 100 mm of space above Naava for maintenance. 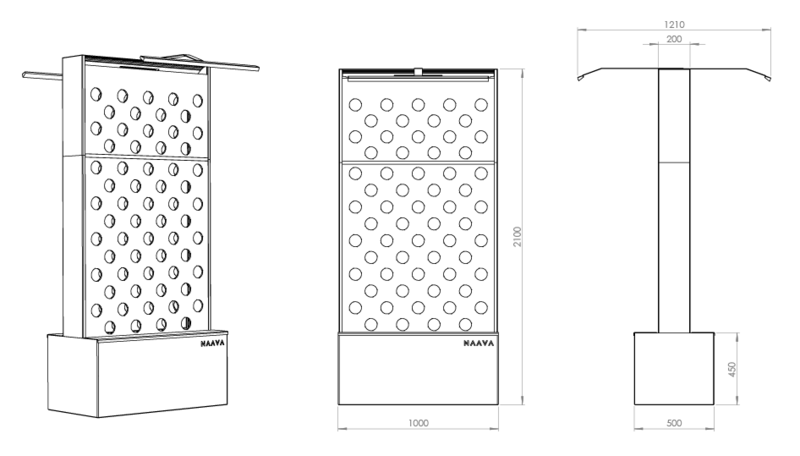 If Naava is embedded in the wall, both sides should have 15 mm of space and the top should have 100 mm of space above it. 3G network is required for Naava to be able to send data to our cloud system and adjust the functions accordingly to the surrounding conditions. 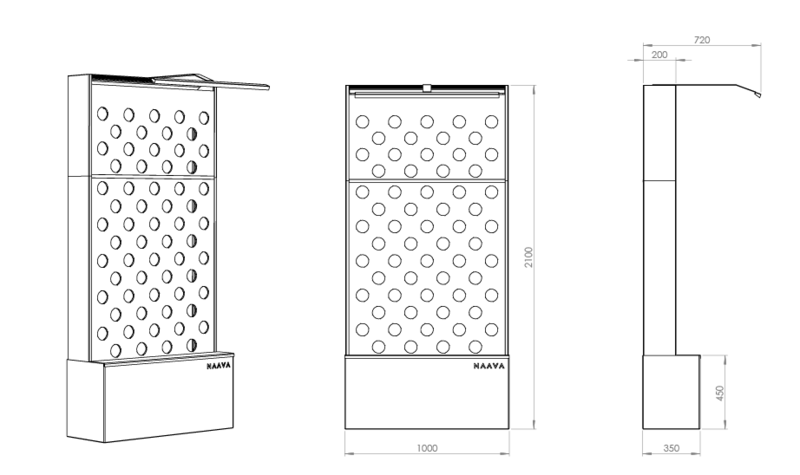 If Naava is connected to the mains, its water tank will need its own water and drain fittings. 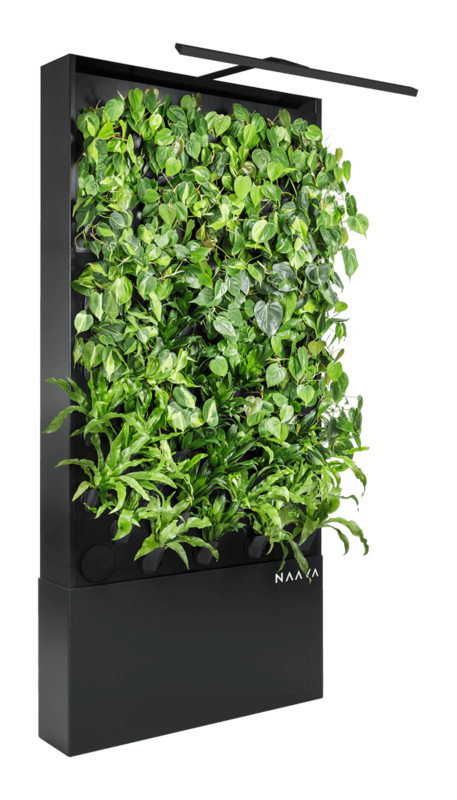 Naava's plants are carefully selected, safe, eye-catching, resilient and non-allergizing plant species which have been found optimal for air purification. We plant them into our own soil-free growth medium which does not grow mold or cause allergies. That same growth medium also optimizes the air purification efficiency of the plant roots. You can freely choose the plants that fit your design the best from our selection of plants. The indoor air temperature has to be at least +16°C. Does not require natural light. Naava's standard lighting fixtures have the optimal lighting for the growth of plants. The optimal placement is near an inlet. Our experts are happy to help in planning the optimal location of Naava to ensure maximum benefit for people's wellbeing. 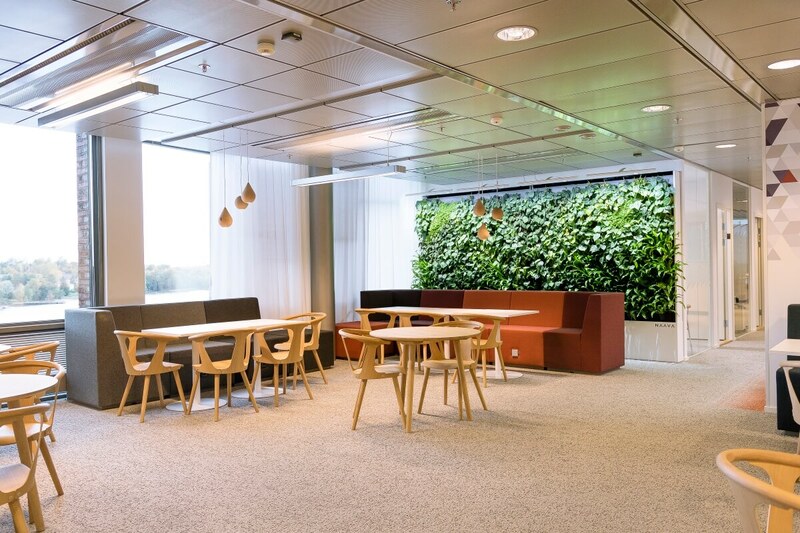 Naava brings the same nature effect indoors that so many other typical green walls do. However, our product is complemented by an all-inclusive service of remote monitoring and regular maintenance in the form of Naava Service. 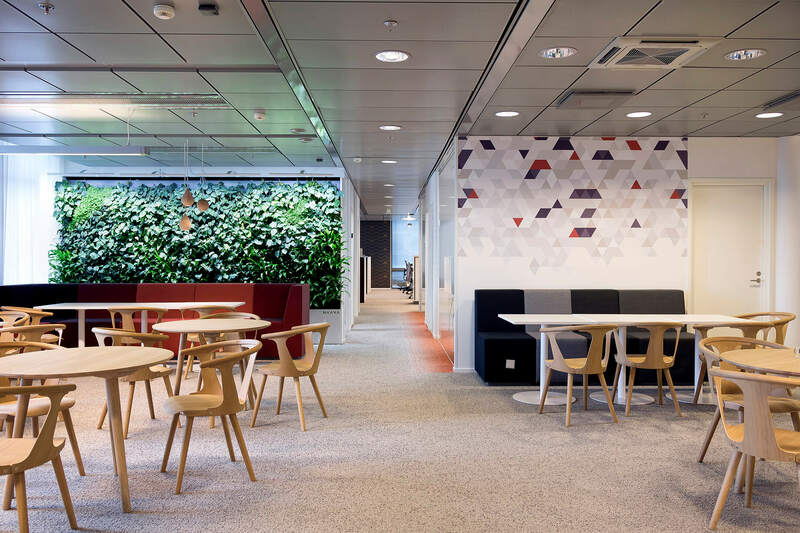 Thanks to this service, Naava is guaranteed to be an effortless solution to people using the space, and will look as striking as ever even years from now. If you would like to try out and plan how the Naava Green Walls could fit into your design, you can download the 3D models of all our standard sizes below.